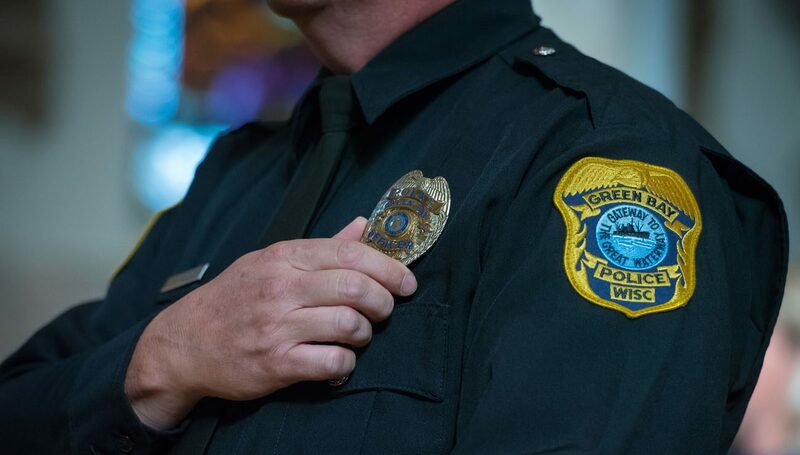 GREEN BAY, Wis. (CNS) — Gratitude summarized the message delivered to members of the public safety profession during the annual Blue Mass celebrated Sept. 18 at St. Francis Xavier Cathedral. Numerous uniformed police and fire department personnel attended the Mass concelebrated by Green Bay Bishop David L. Ricken and five priests, with two deacons assisting. “We join in expressing our deepest gratitude to you for all of the sacrifices you make to put your lives in danger in defense of the public good,” said Bishop Ricken during his homily. Bishop Ricken offered a brief history of the Blue Mass. The first one was celebrated Sept. 29, 1934, by Father Thomas Dade, founder of the Catholic Police and Fire Society, at St. Patrick Church in Washington. The Mass draws its name from the traditional uniform color associated with those professions. In addition to showing gratitude, Bishop Ricken said the Mass also was an opportunity for the community to show solidarity with all public safety members and to extend a blessing upon them. Law enforcement officials sometimes have to make “split-second decisions that are very hard to make,” said Bishop Ricken, “so you need divine inspiration to help you make a good call.” While their professional training gives them guidance, they can also “call upon the divine Lord” in times of trouble. Uniformed professionals are frequently asked to be guardians of public safety, said Bishop Ricken. Just as they are guardians, they can also turn to their guardian angels for their own safety, he added. “God has appointed each one of you a guardian angel. You know what guardianship is about, now take that to a spiritual level,” said Bishop Ricken. The bishop said it is as applicable to public safety professionals as it is to children. Following Communion, Bishop Ricken recited a blessing over all public service members, who stood and placed hands on their badges. Lucero is news and information manager at The Compass, newspaper of the Diocese of Green Bay.